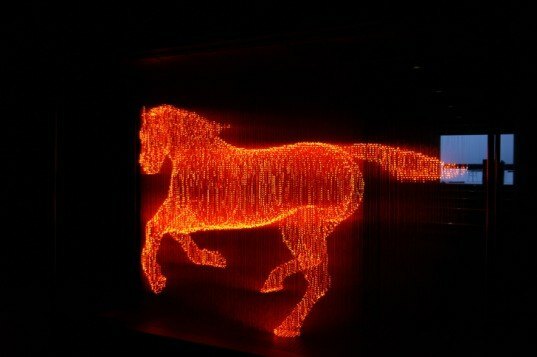 Japanese artist Makoto Tojiki creates breathtaking life-size sculptures of humans and animals that glow with the power of thousands of LED lights. 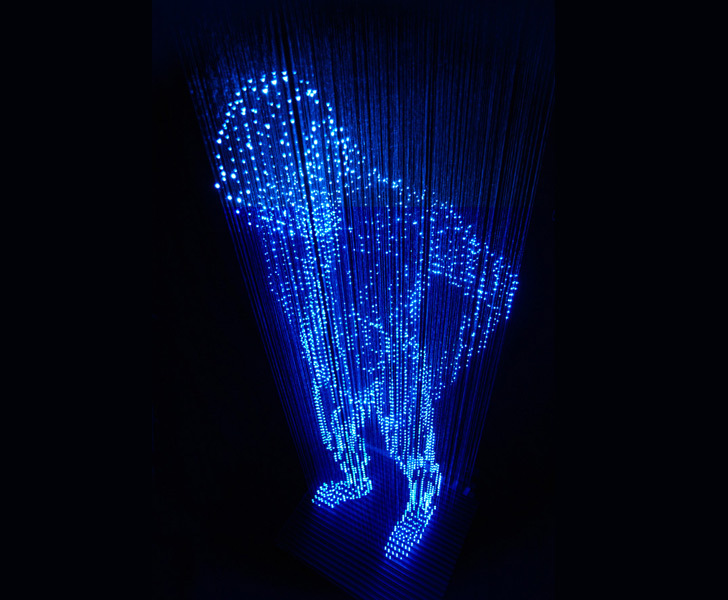 The 3D sculptures are made from hanging strands of LEDs and are part of a series called "No Shadow". Tojiki's work plays with the dichotomy between light and shadow while serving as a brilliant showcase of low-energy lighting technology. Tojiki begins his work process by choosing a living organism and studying its shadow. He then begins constructing a massive sculpture with LED strands. His “No Shadow” works are a play on words and perception, as they do not cast a shadow but can also be considered large glowing shadows of the creatures they represent. Each sculpture engages the viewer, encouraging them to walk around the 3D piece and enjoy the various views from every angle. Set in dim interiors, the lights appear as a solid structure from afar, then a brightly lit shadow at closer glance, then a glowing curtain of light from a few feet away. When the main lights turn on, the sculptures disappear, leaving a translucent outline of what once was there. Tojiki’s talents are not limited to LED light work – he also dabbles in interior design and pioneers a candy-colored jewelry line called Reff. His art has been exhibited all over the world and was even featured in high-end fashion line Hermes‘ window displays in the United States and China. Tojiki begins his work process by choosing a living organism and studying its shadow. He then begins constructing a massive sculpture with LED strands. His "No Shadow" works are a play on words and perception, as they do not cast a shadow but can also be considered large glowing shadows of the creatures they represent. Each sculpture engages the viewer, encouraging them to walk around the 3D piece and enjoy the various views from every angle. Set in dim interiors, the lights appear as a solid structure from afar, then a brightly lit shadow at closer glance, then a glowing curtain of light from a few feet away. When the main lights turn on, the sculptures disappear, leaving a translucent outline of what once was there. Tojiki's talents are not limited to LED light work - he also dabbles in interior design and pioneers a candy-colored jewelry line called Reff. His art has been exhibited all over the world and was even featured in high-end fashion line Hermes' window displays in the United States and China.